The popular anti-wrinkle drug Botox and a competitor have been linked to dangerous botulism symptoms in some users, cases so bad that a few children given the drugs for muscle spasms have died, the U.S. government warned Friday. The Food and Drug Administration's warning includes both Botox, a wrinkle-specific version called Botox Cosmetic, and its competitor, Myobloc, drugs that all use botulinum toxin to block nerve impulses, causing them to relax. Botox is best known for minimizing wrinkles by paralyzing facial muscles - but botulinum toxin also is widely used for a variety of muscle-spasm conditions, such as cervical dystonia or severe neck spasms. The FDA would not say exactly how many reports it is probing. "We're not talking hundreds. It's a relative handful," said Dr. Russell Katz, FDA's neurology chief. 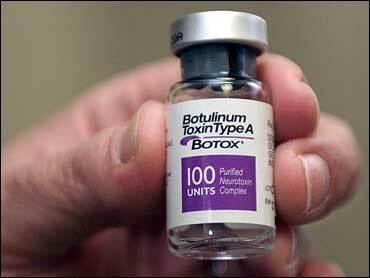 But the agency warned that patients receiving a botulinum toxin injection for any reason - cosmetic or medical - should be told to seek immediate care if they suffer symptoms of botulism, including: difficulty swallowing or breathing, slurred speech, muscle weakness, or difficulty holding up their head. "I think people should be aware there's a potential for this to happen," Katz said. "People should be on the lookout for it." Friday's warning came two weeks after the consumer advocacy group Public Citizen petitioned the FDA to strengthen warnings to users of Botox and Myobloc - citing 180 reports of U.S. patients suffering fluid in the lungs, difficulty swallowing or pneumonia, including 16 deaths. Nor is it the first warning. The drugs' labels do warn about the potential for botulinum toxin to spread beyond the injection site and occasionally kill, but the warnings link that side effect to patients with certain neuromuscular diseases, such as myasthenia gravis. Still, the FDA cautioned that its investigation is in the early stages. It has asked Botox maker Allergan Inc. and Myobloc maker Solstice Neurosciences Inc. to provide additional safety records. Allergan spokeswoman Caroline Van Hove said children with cerebral palsy receive far larger doses injected into their leg muscles than the doses given adults seeking wrinkle care. In a statement, Solstice said it supports FDA's probe but stressed that the agency hasn't concluded the drug poses any new risk. While the FDA said the problems may be related to overdoses, it also has reports of side effects with a variety of doses. Public Citizen's Dr. Sidney Wolfe criticized FDA's warning as falling short. He asked that the agency order a black-box warning, the FDA's strongest type, be put on the drugs' labels and require that every patient receive a pamphlet outlining the risk before each injection. "Every doctor needs to notified about this, every patient needs to be notified," Wolfe said. "Children are showing the way, unfortunately some dead children." He said drug regulators in Britain and Germany last year required that sterner warnings be sent to every doctor in those countries. "What we're saying is, nobody should be dying of Botox, and they wouldn't be dying if the government and the companies were doing a better job warning people," Wolfe said to CBS Early Show co-anchor Maggie Rodriguez.